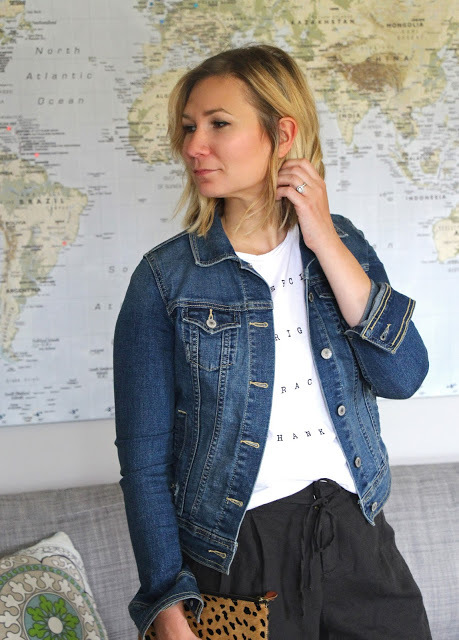 Jean Jacket | T-Shirt: Old Zara. Similar | Shorts: Old Old Navy. Similar | Shoes: Old Target. Similar. Heel Version | Clutch: Old Madewell. Almost Identical. These are my new favorite shorts! They are so swingy and loose and the linen is perfect for summer. I dressed them up a bit here… I would probably wear this to get drinks on a patio with my husband. Also… side note: I forgot to wear jewelry for these pictures. Which actually happens to me a lot in real life. Oh well. I have bigger fish to fry. Such as: I’ve been thinking a lot about how my style impacts the relationships around me. I think, as women, we play the comparison game a lot… especially with our appearance. When it comes to our style it feels good to be the “most fashionable” (whatever that means because we all have different standards… but you catch my drift). When we have that distinction among our peers it gives us a certain amount of control and “power.” Why is that? I kind of hate it. I get that our style is an artistic reflection of who we are internally and I wouldn’t want to change that. It’s fun to put an outfit together, but when we use it as a tool to feel more important than someone else there is a problem. Right? Fashion should be something that brings people together instead of driving them apart. So… lets all make a pact. Lets agree to use our clothes for good instead of for evil.